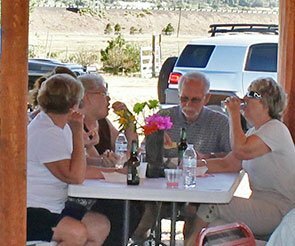 "The Trappers Rendezvous has it all! The cabins are themed with rustic, western charm with updated and modern finishings and each is unique with various accommodations (i.e. 2 queen size beds vs a king size bed, as well as a suite with a king bed that has a separate sitting area with a day bed/trundle). "The owners have spent a lot of time to make sure the guests have the conveniences of home at the same time providing a cozy and comfortable stay. Beds and linens are all brand new and comfy. The kitchen if you choose to do some of your own cooking is fully equipped with a full size refrigerator, stove/oven with all the accommodations needed. "TV's are flat screen, brand new with most channels available - but who wants to watch TV in that setting. 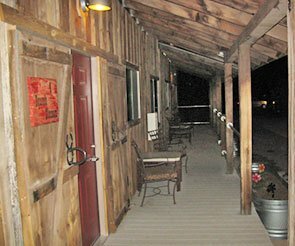 The Trappers is close enough to town by route 66 and located in an open area where you can enjoy the outdoors. During our stay we were visited by elk, dear and many other sources of nature. 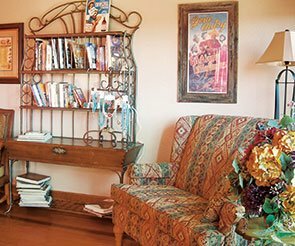 "The Innkeepers are friendly and helpful. The cabins are spotless and have a small refrigerator, coffee pot and microwave for your convenience. Bathrooms are full, with a shower and tub. "There is a shared area in the main Inn where breakfast is served and there is a comfortable reading room. There are outside sitting areas at each cabin. When my fiance and I visited we brought our own smokey joe to grill and were able to enjoy some home cookin. There may be a grill provided by the inn keepers by now...you'll have to check with the Innkeepers. "My fiance and I enjoyed our stays so much we have decided to have our wedding ceremony and celebration at the Trappers under the Pavilion which is in the center of the B&B. "If you have never been to Williams,it's only about 30 miles west of Flagstaff and located on route 66 where there are some of the friendliest people around. The Grand Canyon Railway is in town and has specials for train rides all the time. During the summer you can beat the heat and there a lot of fun activities day and night. Great for couples or families! "You have your choice...just relax and enjoy nature,or go visit town and explore the local stores and restaurants. You just can't go wrong at Trapper's Rendezvous!" Read more reviews at TripAdvisor.com.